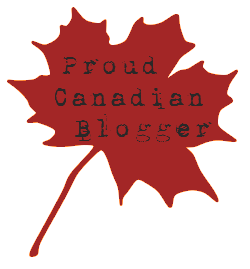 Blog tours are de rigeur for book releases these days. “Flat Stanley” circular tours in three countries–not so common! But Then Comes Winter, the newest offering from Meryton Press, is an unusual book with an unusual team! Holiday romance anthologies and Austen-inspired anthologies come and go, but this compilation isn’t your standard bundle of specific-era themed short stories or Pride and Prejudice variations. 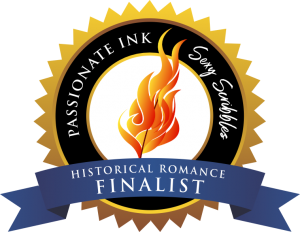 The variety is evident when the only Austen novel missing is Emma, and of the P&P stories, half are loose P&P-esque modern romances with original plot lines. 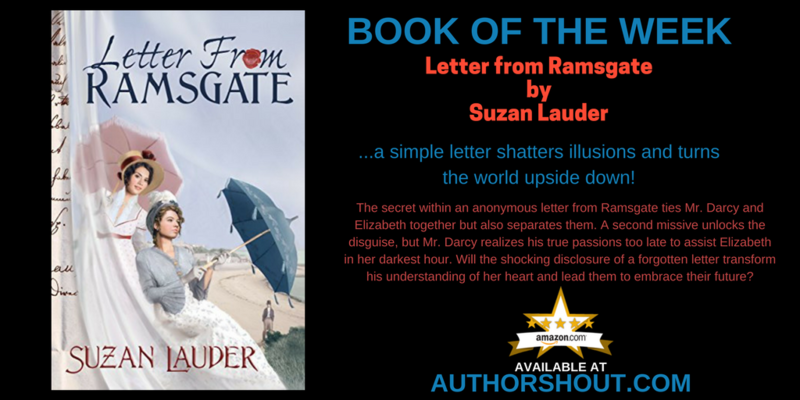 Reviews are coming in with good things to say about every story in the book. The launch events for this book have been fantastic. A week of quizzes and dozens of prizes just wrapped up, and now a particularly special event has begun for this book. Author and blogger Natalie Richards suggested we mail a copy of the anthology around and have each author sign her story so in the end, we have a copy of the book signed by all authors and the anthology editor for a give-away. We each have an opportunity to put in a little extra gift for the prize winner before we pass it on. The “Flat Stanley” book tour route for “Then Comes Winter,” the Meryton Press holiday anthology for 2015. The book’s adventures start and end with our editor, Christina Boyd. The anthology will travel across Canada and into New England, with a virtual trip to Romania before it returns to the US South. It goes cross-country again to work its way up the Pacific coast. The idea was nicknamed “Flat Stanley” after the elementary school activity where children mail a paper doll that travels to family and friends, who photograph themselves with it. Meryton Press will share the progress of the book on A Then Comes Winter Road Trip. Our “Flat Stanley” left NW Washington on November 25, 2015 and arrived in Victoria, BC, Canada on November 26. 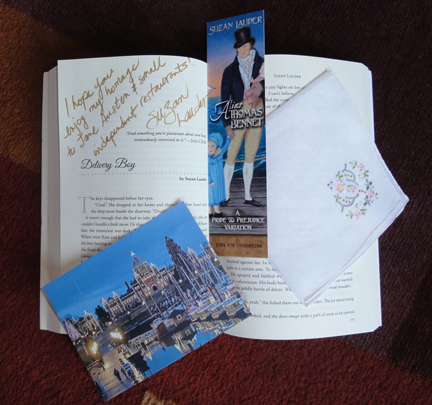 A Victoria, BC postcard, a bookmark for “Alias Thomas Bennet” by Suzan Lauder, and an embroidered handkerchief in honour of the “Thrift Shop Regency Costume Experiment” are tucked into “Then Comes Winter” at Suzan Lauder’s “Delivery Boy” for the “Flat Stanley” Book Tour. 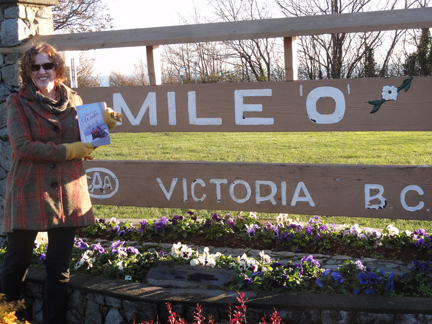 “Then Comes Winter” stops at Mile Zero of the Trans-Canada Highway on November 28, 2015 as part of the “Flat Stanley” book tour. Author Suzan Lauder, with the Strait of Georgia in the background. Victoria is the capital city of British Columbia, Canada, and is in a micro-climate at the southeastern tip of Vancouver Island, which means its weather is significantly milder than the rest of Canada and much dryer than the nearby cities of Vancouver, BC, Seattle, WA, or Portland, OR. The island is about the size of the US state of Maryland or 1/4 the size of England. Most of the population is in the southeastern quarter; the Capital Regional District is home to 360,000 people. About three million passengers per year travel to or from the island by ferry or air, including a float plane landing strip in the downtown inner harbour. 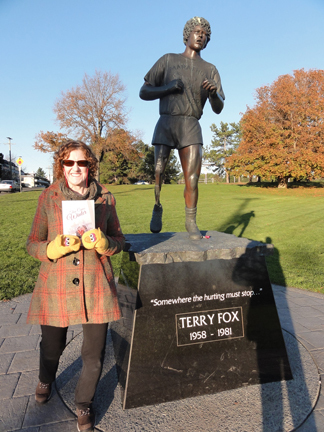 Author Suzan Lauder and “Then Comes Winter” anthology at the Terry Fox memorial statue in Victoria, BC, Canada on November 28, 2015 for the “Flat Stanley” book tour. At Mile Zero of the Trans-Canada Highway, we posed with the statue of Terry Fox, a Canadian hero who attempted to run across Canada in 1980 to raise awareness for cancer–and he had one leg. In those days, prosthetics were nowhere as advanced as they are today, so he had a painful, limping sort of gait. He ran into atrocious weather, drivers who ran his group off the road, blisters, shin splints, and language difficulties, but awareness for his Marathon of Hope ramped up as he continued to run. Unfortunately, he was hospitalized with a return of his cancer at about midway across the country and was unable to finish. He passed away just short of his 23rd birthday, after raising an unprecedented $1 for every Canadian, a total of $24M, and facilitating a huge increase in awareness of the need for funding cancer research. The annual Terry Fox Run is now the world’s largest single-day cancer fundraising event. 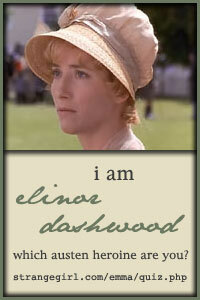 After its stop with Terry Fox, the book was mailed to Alberta, Canada and author Melanie Stanford of Becoming Fanny, one of the nods to Mansfield Park in the anthology. Watch our A Then Comes Winter Road Trip page and social media for her photos! While “Flat Stanley” is in the land of grain fields, dinosaurs, and oil wells, the authors are having yet another party–uh, road trip. 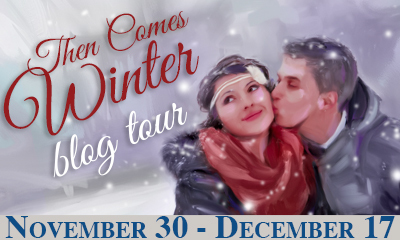 Excellent daily activities are planned for the “Then Comes Winter” blog tour. Yeah, we don’t quit having fun for this book! 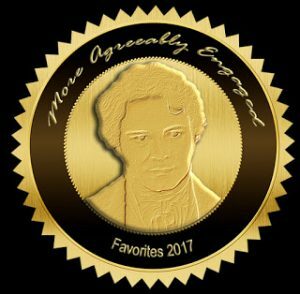 For my part, I’ve arranged to have a little fictional vignette on Janet Taylor’s More Agreeably Engaged: an interview with the “Delivery Boy,” Billy, from my short story in the anthology. 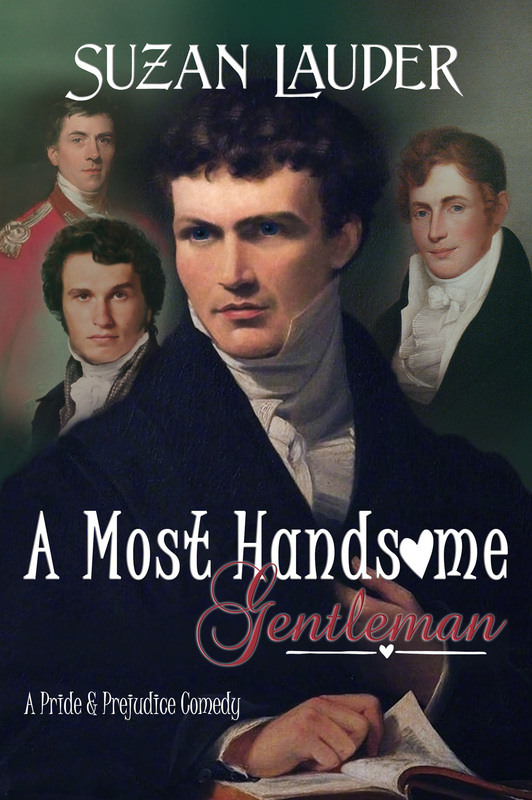 You may recall that my first guest blog was an author interview with Janet just over two years ago, and she’s the artist who turned her modern, bearded son and toddler granddaughter into the Regency cover of Alias Thomas Bennet! (About half way down.) This visit to her blog on December 2, 2015 will also feature a draw for a copy of the anthology for those who comment on the interview. Nineteen stops are featured on this blog tour, enough for an editor and 12 authors, plus a few reviews thrown in just for fun, and quite a few chances for give-aways! 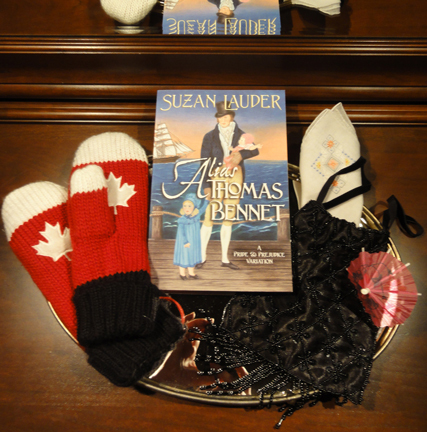 Speaking of prizes, we had a great time during my turn as quizmaster for the Then Comes Winter Launch party, and Lisa Angel won the prize I donated, consisting of nice, warm, Canadian flag mittens, a signed copy of Alias Thomas Bennet, and a signed Regency Reticule from the Thrift Shop Regency Costume Experiment. Kirk Companion won the choice of any Meryton Press book in a random draw for participants in my quiz. Congrats, all those who won prizes, and thanks to all those who participated in the activities all week. I sure had fun! I’m going on a little road trip of my own soon: another vacation to Mexico! 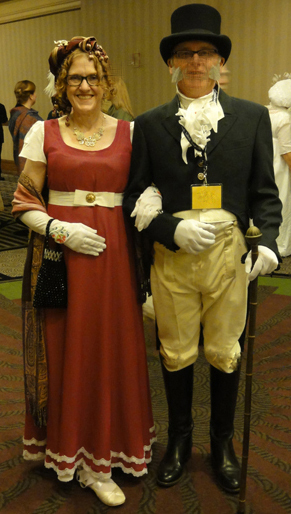 I’ll still be posting Letter from Ramgate at AHA while I’m away, and I hope to join a local writer’s group, and maybe even make some progress on that new Regency comedy I have in my head! Better yet, enter the draw for the “Flat Stanley” book signed by all 13 of us, join in the comments on the blog tour, and comment below on this post! Thanks! January 11, 2016 Update: Keep following the progress of the Then Comes Winter Road Trip on the Meryton Press Blog! It’s has made its way to Bucharest, Romania and MP author Lory Lilian as of this date! 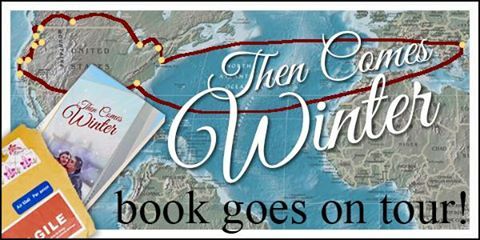 Enter the draw for the whole package: the traveling book signed by editor Christina Boyd and all 12 authors plus all the cool gifts Christina and each author have added along the way. The draw is open until Valentine’s Day!